Japanese Meoto Yunomi - Can You Help? I have two ornate Japanese meoto yunomi, I was told possibly Arita Yaki or Kyo Yaki. My father bought them in Japan for my mother - probably in the 1950's and I've inherited them. 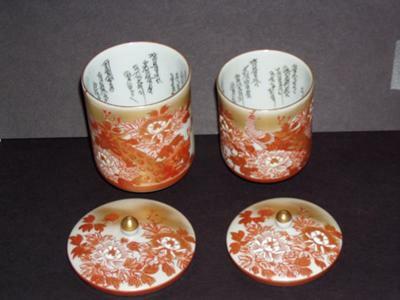 The cups have gold colored rims, and each top "knot" on the covers are gold colored. They each have Japanese writing on the inside and a Japanese letter/word on the bottom. No English markings. I'd be happy to send a few pictures to you if you could help identify them or baring that, point me to another site that could help.